Shark Bay is home to more than 10,000 dugongs (Dugong dugon), about 10% of the world population of this globally vulnerable to extinction species. Dugong breeding and foraging behaviour have been researched, as has their interaction with predators such as tiger sharks. 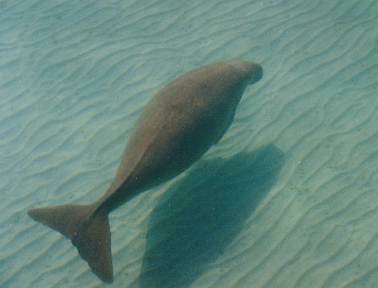 Insights from this research assist conservation management of dugongs and their habitats. Comprehensive tagging and tracking studies in Shark Bay have shown dugongs avoid water temperatures less than 18º C and that dugongs in Shark Bay migrate from the shallow waters of the inner gulfs in summer to warmer deeper waters during winter, switching their diet between different species of seagrass as a result These research programs conducted in conjunction with the local Indigenous group of Shark Bay complemented traditional knowledge from the local Malgana and Nhanda peoples of Shark Bay. Shark Bay contains an estimated one eighth of the world’s dugong population.